Massachusetts has arrived, somewhat by accident to be sure, at state funding ratios for the three public higher education segments: University of Massachusetts campuses, the nine state universities and the fifteen community colleges. Not surprisingly funding reflects status; the University of Massachusetts campuses are on top in per student funding, followed by the state universities with the community colleges bringing up the rear. Interestingly, the ratio of state support per FTE student varies in a simple way. Community colleges received $3357 roughly three-fifths of that disbursed to the state university undergraduates and they in turn receive $5267, three-fifths of that given to support the University of Massachusetts students that amounts to $8685. That ratio, three-fifths, made me think of a famous three-fifths in American history, the three-fifths compromise during the US Constitutional Convention. That compromise gave the southern states the right to count slaves as three-fifths of person for the purpose of political apportionment in the US Congress, despite the fact that slaves could not be citizens, could not hold property and could not vote. Clearly we have moved a long way in the five generations since the civil war that abolished slavery. Yet the unequal support of Massachusetts community college students, predominately low to moderate income and many of color, show that we still have a way to go to address old patterns of power and privilege. Is there a justification for the Commonwealth to give less state support to one group of public higher education students compared with others? I look forward to that debate. Since the Great Recession that began in 2008, public colleges and universities are under increased financial pressure caused by reduced state and local government support. At the same time, private colleges and universities, especially those who are not in the elite class - also find themselves in financial straits as median US family income stagnates while their costs and the cost of attendance has continued to escalate faster than overall consumer prices. Although all of these institutions have reacted by dramatically raising tuition and student charges, this strategy has resulted in higher student debt and push back from students, parents and government leaders. To balance the books, any organization has two choices - increase revenue or decrease costs. Most college leaders argue that it is very difficult to do reduce or significantly moderate the growth in expenses since their costs are driven primarily by employee salaries that typically constitute eighty to eighty-five percent of their budgets. Thus most Americans believe, not incorrectly, that the cost of college, like health care, is out of control. Many companies have discovered ways to utilize the creativity of their employees to improve efficiency while reducing costs. The secret is to implement an idea system that encourages employees to make suggestions of how to change operations, usually in an area that the employee has direct knowledge and engagement. Organizations that have adopted idea systems include major manufacturing concerns, airlines, banks, hotels and health care organizations. Why has higher education been resistant to this possibility? To quote Tevya from the play Fiddler on the Roof, TRADITION. 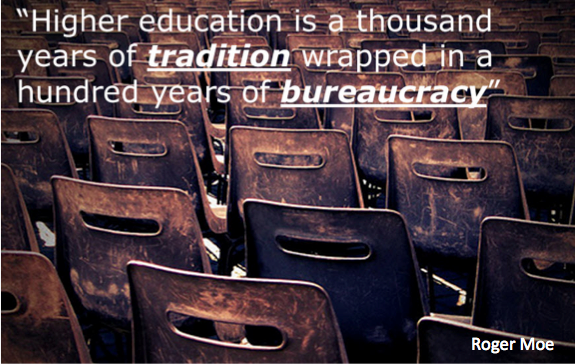 As Roger Moe, a Minnesota State Legislator observed, " Higher education is a thousand years of tradition wrapped in a hundred years of bureaucracy. Mr. Moe was accurate: the oldest continuing operating university in the world is the University of Bologna founded in 1088. And even in the United States, a number of major universities trace their origins from well before the American revolution of 1776 including: Harvard founded 1636, William and Mary 1693, St. John's College 1696,Yale University 1701, University of Pennsylvania 1740, Moravian College 1742, University of Delaware 1743 and Princeton University 1746. Moreover, all American Institutions of higher education trace their origins to the Middle Ages witnessed by graduation ceremonies that display medieval gowns, hats and decorations. Tradition takes other forms in American higher education. The curriculum, especially that in the liberal arts harkens back to the Middle Ages as well as the organization of these institutions with the primacy of the faculty, the separation into distinct disciplines, the collection of credit through a series of courses. That is not to say that many of these traditions are useful and even essential to the well-functioning of institutions that have survived for decades and centuries. However, tradition accompanied by inertia is a powerful force to resist change. Motivated by the desire to improve the education for our students while controlling costs, for over two years, Springfield Technical Community College has been experimenting with an idea system. While the President of the college proposed adopting this initiative, some cherished management views often not explicitly stated had to be jettisoned. The most significant was the principle that the administrators and the faculty in the area of instruction understood how to run an effective institution. From this perspective, the administration responsible for the institutions finances, had the knowledge and tools to advance efficiency and find ways to control costs. How could this not be true? A look at the pyramid below is instructive. 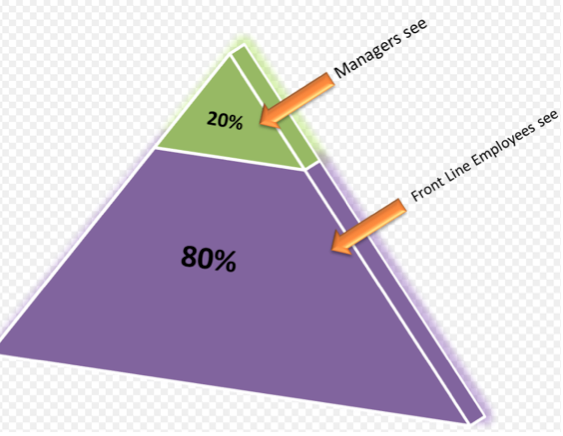 This diagram shows the organization as consisting roughly of 20% managers and supervisors, and 80% of employees who provide direct service to students and internal customers - faculty, counselors, student support staff in the registrar's office, admissions and financial aid, counselors, maintenance personal, custodians. This is not an exhaustive list but should include all employees who see individual transactions between their departments or offices and students or other constituents including parents. Now here is the crucial observation. Administrators by and large do not see individual transactions, the ongoing work of the organization such as the interaction between students and faculty in the classroom, the communication about an individual application with the financial aid office and the like. Administrators see rolled up data, aggregated information such as the total number of students in a particular major, the number of students who received financial aid. If these numbers are stable or increasing, the administration is generally pleased. However, administrators, those in the twenty percent of the pyramid, are not privy to these individual transactions and therefore cannot suggest incremental improvements. The people on the front lines, the eighty percent can do that. And since they do most of the work and make up the greater part of the organization, their creativity and willingness to seize opportunities for improvement can over the long term cause improvements.